First, my idealized faceting machine. Here are the fundamental pieces of the machine, but not some important necessities. For instance I do not show any of the "locking" mechanisms. Once the angle is set on the protractor, there must be a way to limit further cutting. A "lock" at the angle. The index gear must be locked into one of the gear positions and not allowed free movement during the cutting process. I am not showing them here because they differ on every machine, I have simplified the diagram to show the types of movement necessary to cut, not the exact mechanism that accomplishes it. In the next few pages I will go over each of the movements and explain what what they accomplish. 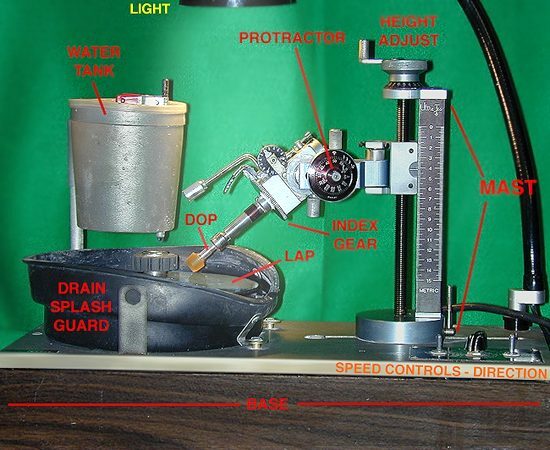 The image below is my actual Ultra Tech faceting machine. The same items are named as those in the above diagram. Again I am not identifying the "stop" and "locking" mechanisms as some have changed even within the Ultra Tech line as newer machines were designed. What you see on this model might or might not reflect them on newer models or on models form other manufacturers. One thing I will mention is that the Ultra tech uses a circular protractor system that requires more than one full revolution to demarcate 90 degrees. (The longer a protractor is, the more accurate it can be.) The circular design provides more effective length in less actual space. Accuracy n a faceting machine is important, but even more important is repeatability. You need to be able to adjust the machine once, change to new settings, then return accurately to the original settings. A mechanism that provides for quick large adjustments, followed by smaller more precise adjustments is very useful. 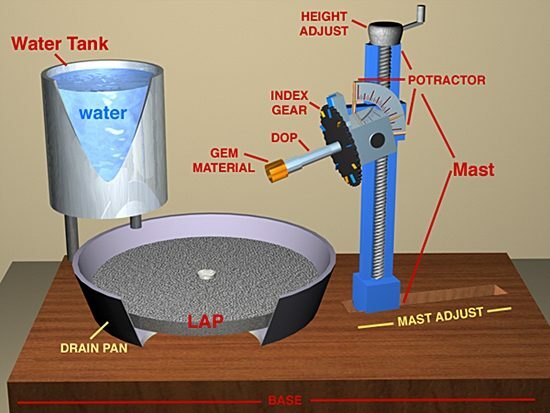 Everything associated with the "faceting head" should be made of rugged materials and should not be prone to bending or deformation under normal usage. If some part of the mechanism bends under normal pressure, then it will never provide easily repeatable results. A rigid frame work is very desirable. Here are some important considerations as far as I am concerned. Over sized framework material. No plastic bearings or gears. once the settings are locked down. There should be no extraneous movements once a setting is secured. Ability to accurately repeat a setting. When a setting is made, I want to be able to reset it exactly later. I don't really care if the machine indicates 5 degrees when the setting is actually 5.1 degrees, as long as it is always the same, and will return to the same position each time. It is very desirable to have a doping mechanism that provides a way to remove a stone form the facet head, then replace it. After replacement it must be precisely in the same relationship to the index gear as it was originally. The facet at he first position must be reindexed to exactly the first position when returned. continuously adjustable speed on the lap, NOT: high, medium, low. The lap should also be able to run backwards if needed. The DOPS should be a standard and easily accessible size, 1/4" or other easily obtainable size,and should be designed from simple rods. This makes it possible to easily create custom dops as needed. I don't want funny shapes or weird tapers. The splash guard system need to be easily cleaned without a major disassembly. During the polishing stages you may need to clean it several times, and it should fast and relatively painless. You must have a bright light that can be adjusted for viewing your work. This is especially important during the polish process.